Jefferson’s last years were hounded by large debts. In February, 1826, he asked the Virginia General Assembly for authorization to sell his lands in a public lottery; or else he would be forced to leave Monticello. A bill authorizing the sale passed, and lottery tickets were issued. But the drastic measure was not needed. News of his plight moved citizens across the country to send donations, and Jefferson remained in his home until his death on Independence Day, 1826. Shelley, Mary Wollstonecraft. 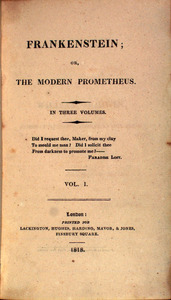 Frankenstein; or The Modern Prometheus. London: printed for Lackington, Hughes, Harding, Mavor & Jones., 1818. First edition of the novel that launched a thousand horror movies. From the Sadleir-Black Collection of Gothic Fiction. The Confederacy issued paper money to finance the war, rather than borrowing heavily or taxing the populace. Almost sixty percent of its income came from such issues. By 1865 there was an eleven-fold increase in the amount of money in circulation. The Confederate dollar was worth less that 1/100 of its original value. Today it is worth at least its face value to collectors. In addition to Confederate money, this department has a collection of currency from other sources and time periods. Robert E. Lee paid $200 for a handsome grey horse called "Jeff Davis" in 1861. Renamed Traveller, he accompanied his master throughout the war. Traveller’s startled rearing at an artillery burst during Spottsylvania plunged Lee away from a direct hit and saved the General’s life. By the war’s end Traveller’s mane and tale were plucked almost bare by souvenir hunters. 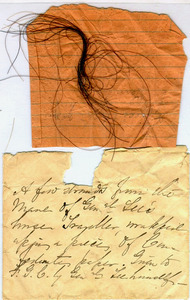 A member of the Cocke family claimed that these strands were given to him by Lee himself. Traveller is interred outside of the Lee Chapel at Washington and Lee University. 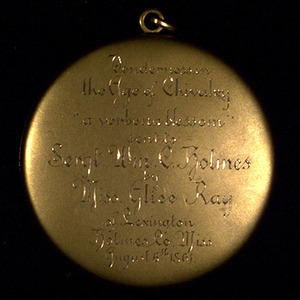 Blossom and ribbon, 1861; gold locket, 1914. William C. Holmes, a University of Virginia student and later captain of Company B, First Mississippi Battalion of Sharpshooters, was given the blossom by Miss Alice Ray of Lexington, Mississippi. He kept it in his diary, wrapped in a piece of paper inscribed, "What is home without a Mother?" 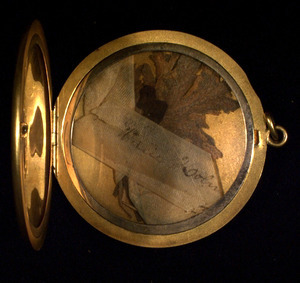 Fifty-three years later it was encased in the locket and given to his alma mater so that "the generations to come on viewing it will know that in that cruel age of war, there was a star, brighter than any in the galaxy...'woman’s tenderness'."